MATRIKX® Extruded Carbon Filters are No.1 in quality available for RO/DI applications. 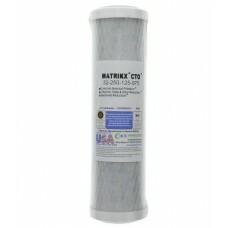 There is none better!MATRIKX is finished with pre-filtration wrap, end caps and gaskets. Because MATRIKX® filters are produced by continuous extrusion; they have very small tolerances for defects. All MATRIKX® Extruded Carbon Filters are manufactured using FDA-compliant materials. Specific models are designed to meet NSF/ANSI Standards 42 and 53. Extruded carbon filter elements can be used in potable water applications, as well as for industrial, food service and commercial applications, in otehr words- perfect for tha aquarium application. WHAT IS EXTRUDED CARBON BLOCK? Extruded activated carbon filters consist of virgin activated carbon powder, a thermoplastic binder, and specialty adsorbents such as zeolites or oxidizing filtration media. The filters are manufactured as continuous lengths of rod, tube, slab, flexible flat sheet, or as other complex shapes using a proprietary solid-state extrusion process. The resulting products are highly porous and extremely uniform, providing high-performance adsorption and particulate reduction at low flow resistance when fabricated into finished filter elements. Standard consumer and commercial filters manufactured by continuous solid-state extrusion cost approximately the same as conventional filters manufactured using loose granular activated carbon, but provide an enormous spectrum of performance advantages. 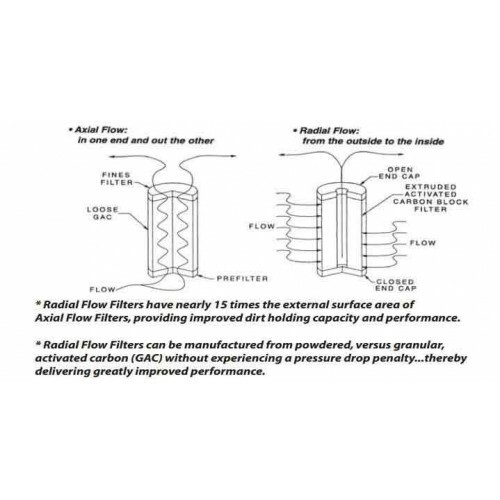 Extruded activated carbon filters meet exacting performance requirements and/or claims, and specific models are registered as meeting the requirements of NSF/ANSI for VOCs and THMs reduction, particulate, cyst, turbidity, lead reduction, chlorine taste and odor reduction, and other requirements relating to purity and safety of their materials of construction. 1) No release of carbon fines: Extruded filter elements do not release activated carbon particles ("gray water") during startup or operation. Extensive flushing or "activation" of extruded filter elements are not required. Some GAC carbon filters will release carbon fines even after the filter elements have been in service for an extended period of time, resulting in contaminated sumps and plumbing and a non-sanitary condition. 2) No channeling, fluidizing, or bypassing: Extruded filter elements cannot channel, bypass, or fluidize because extruded carbon is a rigid structure that prevents movement of the adsorbent particles or the formation of channels and defects in the adsorbent structure. 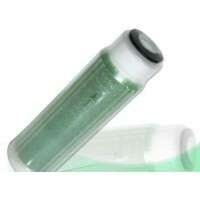 GAC filters consist of loose beds of particles that are often loosely packed into a non-rigid plastic tube (you can often hear the particles move when GAC filters are shaken). Bypass of the carbon is common because the plastic container often expands away from the carbon when under pressure, leaving a sorbent-free zone. At sufficient flow, the entire bed will fluidize and the integrity of the adsorbent bed will be lost. GAC filters cannot be operated in a horizontal arrangement because the carbon will settle, leaving an open channel along the top of the filter. 3) Low pressure drop: Water flows through an extruded filter element in the "radial" direction (from the outside of the filter element to the inside). As a result, the entire exterior surface of the filter is presented to the incoming fluid, not just off one edge of the filter as in most GAC filters. 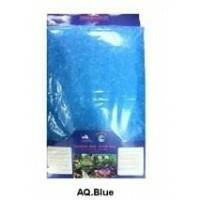 This results in nearly fifteen times more pre-filtration surface area and a much lower flow "density". In a GAC filter, a fluid flows at high velocity through the entire length of the filter, often about eight (8) inches of carbon. In an extruded filter element, the fluid flows slowly through only the thickness of the filter's wall; often less than an inch. While the contact time between the fluid and carbon are basically identical in both cases, the extruded element displays almost ten times less pressure drop when the adsorbent particles are the same size. 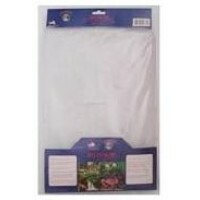 Dimensions: 9.87" x 2.5" x 2.5"
This product is proudly "Made in the U.S.A."